From concerts and festivals to sports exhibitions, sneaking alcohol into places or events where it’s not permitted (or is potentially overpriced) has become so prevalent, it’s influenced where and how alcohol is sold. Of course, sneaking alcohol into these events isn’t the only thing Americans are getting away with, and illicit drug use at some public gatherings has become so risky that medical officials volunteer their time to keep people safe. 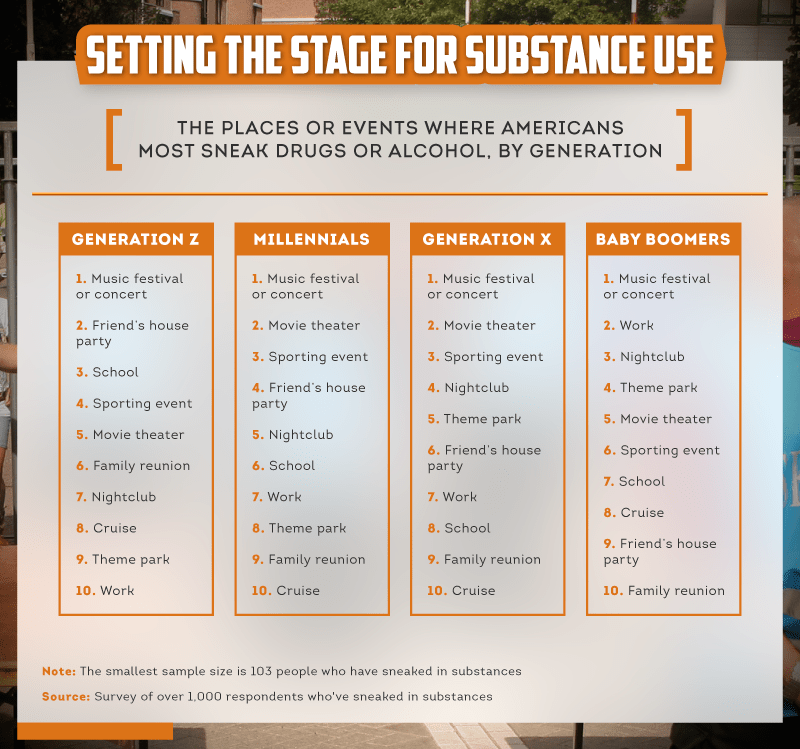 To learn more, we surveyed over 1,000 Americans about the prohibited drugs and alcohol they’ve brought with them to public outings. 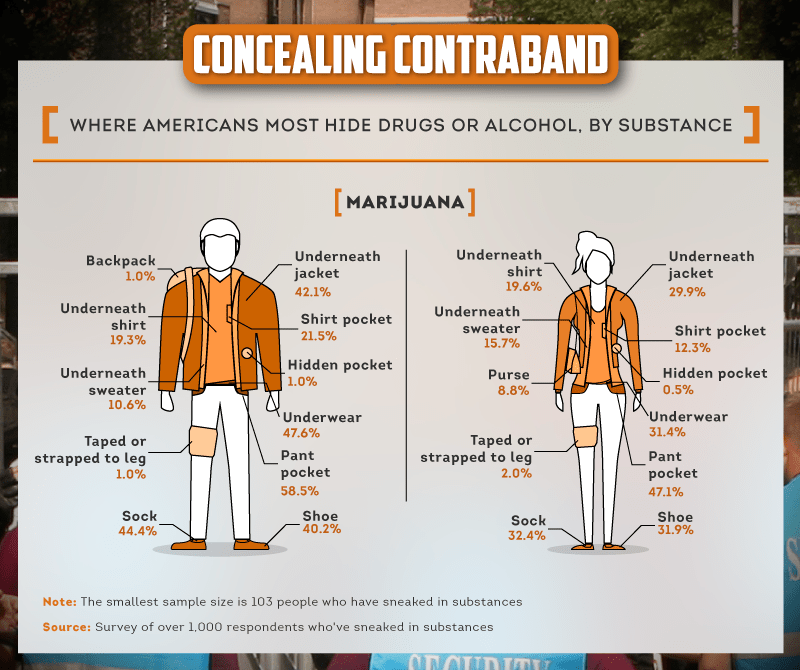 From sneaking hard liquor onto a cruise to bringing marijuana to work, we wanted to know where (and how) most Americans are concealing their contraband. Curious where most people are stashing these substances or how often they’re convincing someone else to do the dirty work? Read on to learn more. 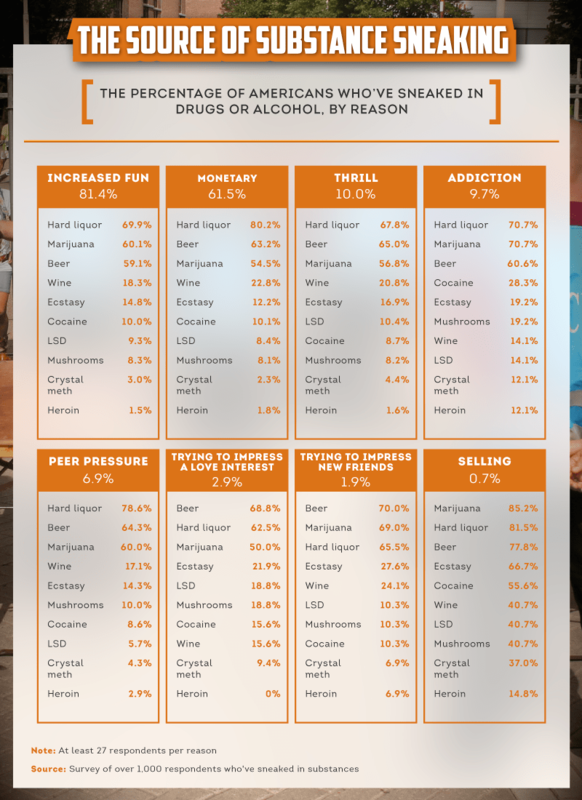 Nearly 4 in 5 respondents have sneaked in prohibited drugs or alcohol to a place or event. Of those instances, over 68 percent of men and women acknowledged their prohibited spirit of choice was hard liquor. According to the National Institute on Alcohol Abuse and Alcoholism, a single shot of gin, vodka, or whiskey is the equivalent to a glass of wine or can of beer. Our survey also revealed more than half of men and women admitted to bringing marijuana to an event where it wasn’t permitted. Currently legalized for recreational use in seven states (in addition to Washington, D.C.), even regions where marijuana use has been decriminalized have regulations on where it can be consumed. And just where are these prohibited substances showing up? Across every generation, the most common location for restricted goods was a music festival or concert. While it may not always be the case, illicit substance use at festivals has proven fatal in some instances. 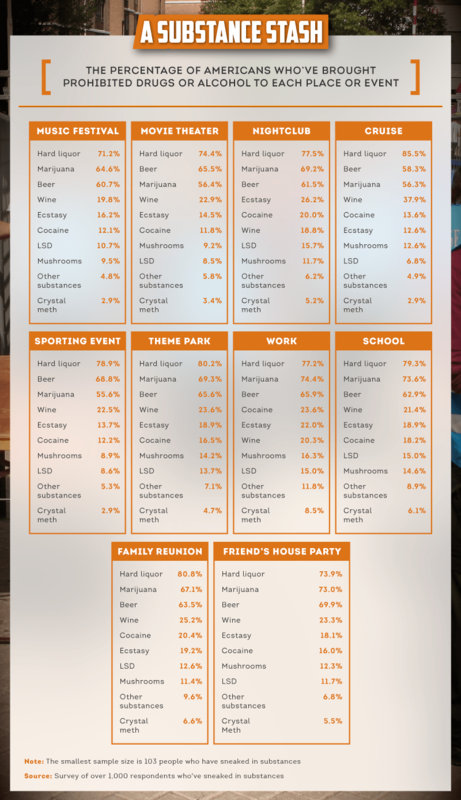 The youngest Americans (Gen Zers) surveyed admitted sneaking drugs or alcohol into a friend’s house party or onto school grounds, while older men and women (baby boomers) brought prohibited paraphernalia to work. Sneaking alcohol into a sporting event or music festival may sound less surprising than some other venues, but what about movie theaters, theme parks, or even the office? According to our survey, hard liquor shows up at these places more regularly than you might expect. Our analysis revealed more than 3 in 4 Americans admitted to bringing prohibited liquor to their place of work. Studies have shown working longer hours can increase the likelihood of excessive alcohol consumption and risky drinking behaviors. While some companies in the U.S. may allow drinking during office hours, research suggests long-term drinking can have severe consequences to the body including the liver, pancreas, and immune system. Even more men and women (more than 79 percent) smuggled hard liquor into school. According to the Centers for Disease Control and Prevention (CDC), roughly 1 in 6 high school students binge drink, a trend that may continue into college for many. Marijuana was most commonly sneaked into work and school as well, and roughly 2 in 3 people brought beer to a movie theatre. Sixty-one percent of men admitted to hiding prohibited alcohol underneath a jacket at a place or event, while more than 68 percent put the substance in their pant pocket and nearly 27 percent thought the safest place for their bootleg booze was underneath their shirt. Women had similar opinions on how to get their libations in, and more than 42 percent opted to hide spirits in their pant pocket. People didn’t go to as great of lengths to conceal alcohol, but they were definitely more conscious of keeping illegal drugs hidden. More than half of men and women kept ecstasy in their underwear, and as many said they put cocaine in their socks or shoes. 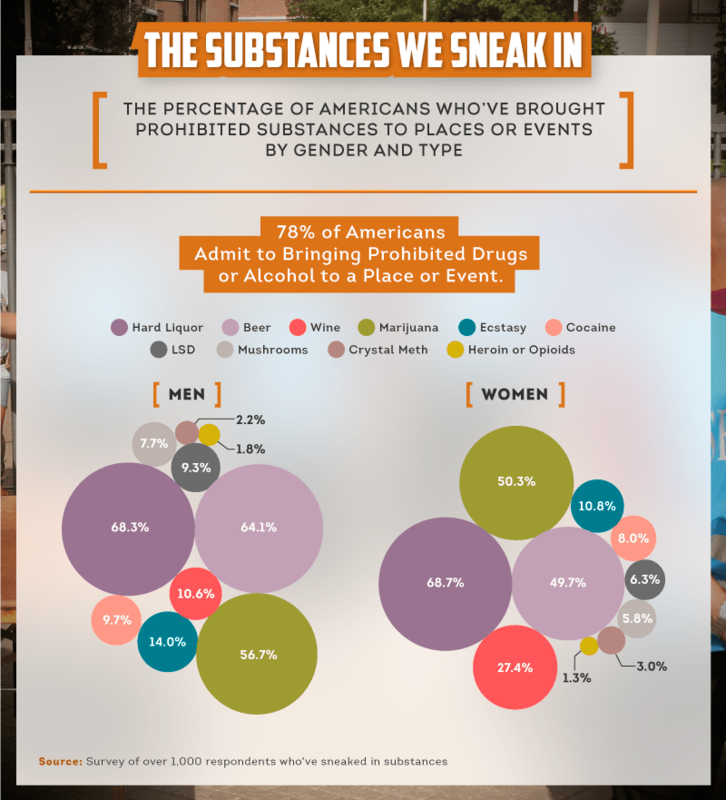 A vast majority (4 in 5) of Americans brought prohibited drugs or alcohol to sporting events, concerts, theme parks, and more for one reason: to have fun. While it’s possible to feel a range of emotions (including relaxed, confident, or energized) while drinking, the perception that alcohol is a necessary ingredient in having a good time could be a myth. In reality, it could be the environment or company kept while drinking that makes people feel so good. More prominent logic behind concealing drugs or alcohol in public included monetary reasons (such as saving by avoiding concession prices), thrill, and (for nearly 1 in 10 Americans) addiction. Despite increased support for legalizing marijuana use, nearly 71 percent of people who sneaked marijuana into a venue or event were addicted to the substance. More than 1 in 4 people who concealed cocaine acknowledged the same, and over 19 percent who smuggled ecstasy did so because they were dependent. 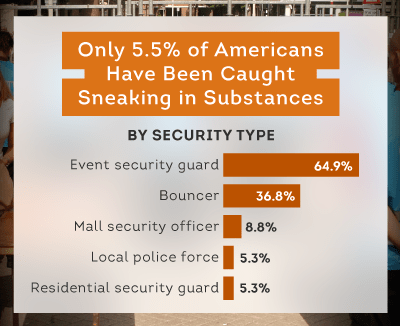 Security precautions at events (including concert festivals and sporting games) may be increasing, but that doesn’t seem to have stopped most Americans from attempting to smuggle in their substance of choice – or led to particularly high capture rates according to our survey. 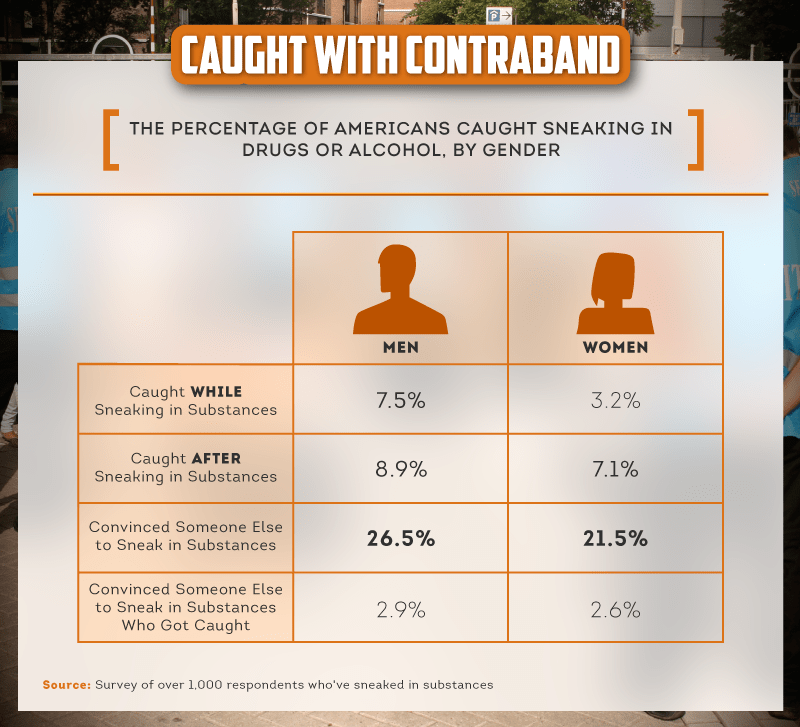 Less than 8 percent of men and just over 3 percent of women said they’d been caught trying to bring a prohibited substance to a place or event. Slightly more (between 7 and 9 percent) got caught after the fact. More often, people relied on someone else to do the dirty work rather than risk detection themselves. 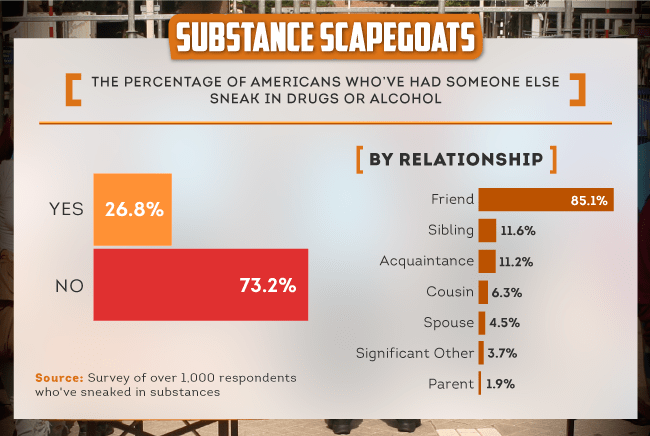 Over 1 in 4 men and 1 in 5 women persuaded someone else to sneak in substances – leading nearly 3 percent to admit their friends were caught in the process. With so few Americans ever being caught attempting to smuggle prohibited substances into an event, we asked thosewho’d been found out who nabbed them in the process. According to more than 3 in 5 Americans, it was event security that exposed them. A bouncer caught more than 1 in 3, and less than 1 in 10 said it was a mall security officer. And as for the generous companions willing to risk their own detection (or worse) by carrying in restricted substances for someone else? We learned over 85 percent picked a friend to help them smuggle in drugs or alcohol, while 1 in 10 said it was a sibling or acquaintance who aided in sneaking risky goods past security. While a majority of people sneaked drugs or alcohol into music festivals, theme parks, and nightclubs to have a good time or avoid paying a markup, some admitted doing it because they were addicted or couldn’t go a few hours without this prohibited intoxicant. Getting these substances into public events or places may not be difficult, but it can be deadly. If you or someone you love has an alcohol misuse disorder, help is here for you. Alcohol misuse kills 75,00 Americans every year, including more than 1,800 college students. At Alcohol.org, our mission is to help Americans drink responsibly and understand the dangers of alcohol misuse. We collected 1,294 male and female survey participants from Amazon’s Mechanical Turk. 81% of our participants claimed to have sneaked substances such as alcohol or drugs into an event or venue when it was not permitted, and 19% said they never did this. Participants ranged in age from 18 to 73, with an average age of 34 years old. We excluded participants who had never sneaked in a substance in the past. We weighted the data to the 2016 U.S. Census for gender.